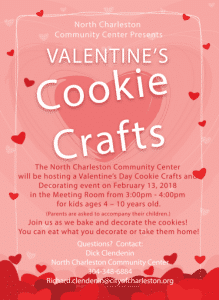 The North Charleston Community Center will be hosting a Valentine’s Day Cookie Crafts and Decorating session on February 13, 2018, in the Meeting Room from 3-4 p.m. The event is for youth ages 4 – 10 years old. Parents are asked to accompany their children. They will be baking Valentine cookies and decorating them. Come and have some tasty fun at the North Charleston Community Center on Feb. 13th. You can eat what you decorate or take them home. Call 304-348-6884 or email Richard.clendenin@cityofcharleston.org for more information.